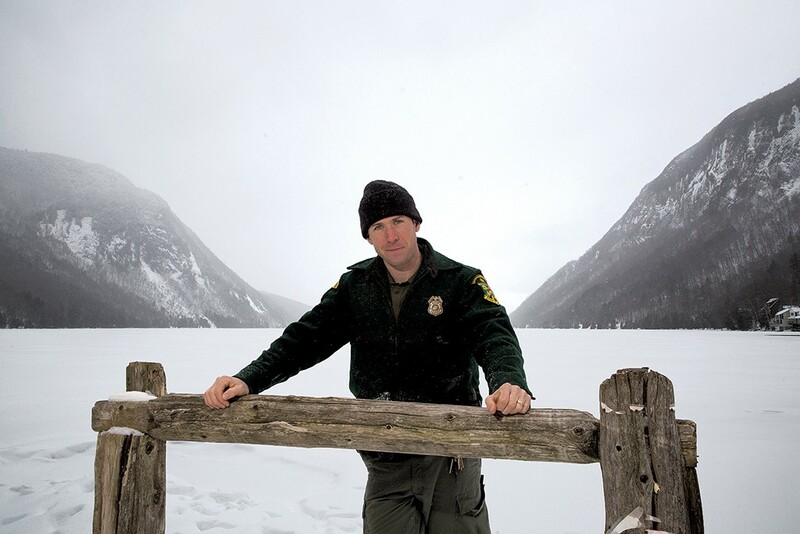 Vermont Fish and Wildlife game warden Mike Scott said goodbye to his wife and 6-month-old daughter on the morning of January 26 and walked out of his home in Barton. He planned to start the winter day as he often does, checking the licenses and catches of the handful of ice fisherman huddled on frozen Lake Willoughby. But first, Scott, 31, scraped ice from his pickup's windshield and attached a new plastic cellphone holder to the dashboard inside. At 8:59 a.m., his radio squawked. A dispatcher barked out Scott's call sign. Scott, who has been a warden for three years, can tell from a dispatcher's voice if a call is routine or urgent. This was clearly not about a dead deer on the shoulder of a road. "Nine sixty-nine," Scott immediately answered. "Can you respond to Blueberry Point on Lake Willoughby?" the dispatcher replied. "Fisherman on ice heard yelling for help. Caller can't see him." The big lake, a scenic gem surrounded by hills and forest in neighboring Westmore, is eight miles down a winding two-lane road from Scott's home. Scott turned his emergency lights on and got there in eight minutes. He had performed an ice rescue only in training. But he knew Willoughby well. He had fished it just the day before. The ice was thick close to shore, but at Blueberry Point, he knew, it was dangerously thin — open water was only a couple dozen yards away. Scott stopped at the end of a side road. From the back seat, he pulled out his float suit — a one-piece suit made of foam insulation, designed to keep him warm and buoyant in frigid water. He quickly pulled it on over his uniform. He grabbed a rope and handheld ice spikes, used for gripping the slippery surface, and scrambled down a steep, 50-yard slope to the lake's western shoreline. On its slushy surface, he saw a single set of footprints headed toward Blueberry Point, a few hundred yards across the ice. Oh God, Scott thought to himself. It's Richard. The day before — his day off — Scott had gone fishing and ran into Richard LeBlanc at the same spot where the footprints began. LeBlanc, 62, was a veteran ice fisherman from nearby Orleans whom Scott knew from his work checking licenses and inspecting catches on Northeast Kingdom lakes and ponds. A lot of fishermen don't like a game warden with an eye for violations poking around. But LeBlanc always seemed happy to have a visitor stop by and chat. The blades on Scott's auger — a drill used to make holes in the ice — had gone dull, so LeBlanc had lent the warden his. For the next couple of hours, they fished together for the first time. They chatted amiably and occasionally held up their bigger catches for each other to admire as they worked holes that were a couple dozen yards apart. When LeBlanc caught a large salmon, rare for this time of year, Scott rushed over and held the fish while LeBlanc pulled out his tape measure to confirm that it was, in fact, big enough to be a legal catch. As they fished, LeBlanc asked Scott if anyone had recently caught any smelt in the lake. No one had, the warden replied. Every Lake Willoughby angler knows the best place to find the flavorful little fish is on a peninsula on the west side of the lake: Blueberry Point. Now, as Scott neared that spot in his float suit, he saw two arborists who had been working in the area trying to edge their way onto the ice to reach the fisherman. They had been the ones to call 911 after hearing the cries for help. The last thing Scott wanted was for them to get into trouble on the ice. "I'm coming, I'm coming," Scott yelled, urging them back. He threw them one end of a rescue rope, and he held the other end, telling them to get ready to pull him back to shore when the time came. Scott knew time was running short. In a best-case scenario, a person who falls into such frigid water has 15, maybe 20 minutes before freezing to death. It had taken him eight minutes to get there, and more to don the suit and reach the lake. To distribute his weight on the thin ice, he crawled on his belly toward a hole about 40 feet from shore. As he got closer, he saw a dark mass submerged in the water — the fisherman. The ice beneath him started to undulate. Finally close enough, Scott lunged, grabbed hold of clothing and pulled upward. The fisherman's head emerged from the water. It was LeBlanc, and his skin was whitish blue. He wasn't talking. Scott braced his upper arms on the ice and tried to pull LeBlanc from the water. But the load was too much. The ice gave way, and he toppled into the water, too. The initial rush of cold nearly took his breath away, but the suit kept him safely warm. There was no way he could climb back onto the ice with LeBlanc. Even if he did, the frozen surface surely wouldn't be strong enough to support both of them for the trek to shore. Thin ice surrounded them. Scott made a snap decision. He left LeBlanc. Using his elbows as hammers, he bashed his way through the ice toward shore, creating a channel. Then he turned around, frantically paddled over to LeBlanc and, with the arborists on shore pulling him, dragged LeBlanc through the channel to shore. The effort took about five minutes. Others were arriving to help. Barton Ambulance Squad chief Luke Willard, who had been puttering in his garage when he heard the dispatch traffic on the radio, took a couple of spills running down to the lake and got there as the men were being hauled to shore. Willard helped Scott and the arborists lift LeBlanc from the water and onto a flat area on shore. Other rescuers, from the Barton Ambulance Squad and Westmore Fire Department, arrived, too. One team had a defibrillator. They ripped open LeBlanc's shirt and placed the machine on his chest. The defibrillator scans for any indication of electrical activity in the heart. If it detects any, the machine commands the user to administer a shock. The defibrillator can only strengthen an existing pulse — it cannot revive a heart that is not beating. Every couple of minutes, the defibrillator announced, in a programmed voice, "Shock not advised." Scott and others continued chest compressions, hoping to generate heart activity that might respond to an electric shock. After the defibrillator announced a half dozen times, "Shock not advised," the rescuers loaded LeBlanc onto the back of a Westmore Fire ATV and took him to a nearby ambulance. He was pronounced dead soon thereafter. Scott stayed at the scene, trying to figure out what went wrong. Ice fishermen are taught to drill test holes as they venture out, to make sure the frozen surface is thick enough. The ice was about six inches thick where Scott and LeBlanc had fished the prior day, about 30 yards from the shore. It appeared that LeBlanc drilled only one test hole on his journey to Blueberry Point, about halfway there. At that spot, the ice was about four inches thick. Where he fell through, it measured an inch and a half. LeBlanc's wife, Sue, a paraeducator at the Glover Community School, told the Barton Chronicle last week that her husband usually fished smaller bodies of water where the ice tends to be thicker. But he had recently caught a large trout on Willoughby, she said, and was excited about the prospect of bigger catches. She had given him a new auger for Christmas. She also told the Chronicle that her husband, who spent time as a farmer and a factory worker before retiring last August, couldn't swim. They'd been married 10 years. Back on shore, Scott was getting ready to leave. It was only 9:30 a.m. His day had just started. He didn't know it yet, but his workday was also going to involve a roadkill deer in Derby, a search for a sick moose in Canaan and a nighttime call about a truck falling through ice into Lake Memphremagog, from which the driver would swim to safety. But first, Scott guided his truck back home to Barton. He went inside for a hot shower and a fresh uniform, and to say hello to his wife and baby daughter. The couple had named their girl June. They both liked the sound of it. They had given her a middle name, too, to acknowledge the child's roots in the Northeast Kingdom: Willoughby. Editor's note: This story is drawn from interviews with Mike Scott and Luke Willard, Scott's preliminary incident report, and a Vermont State Police news release.